Because of the ubiquitous nature of cucumber beetles and the high potential for damage, the focus should be on managing these insects. Aphids and spider mites do not always develop to damaging levels, so the use of insecticides for control of these pests should be on an as-needed basis. Finally, pickleworm can be a serious pest late in the season, usually after mid-August. Pickleworm control is rarely required before this time. 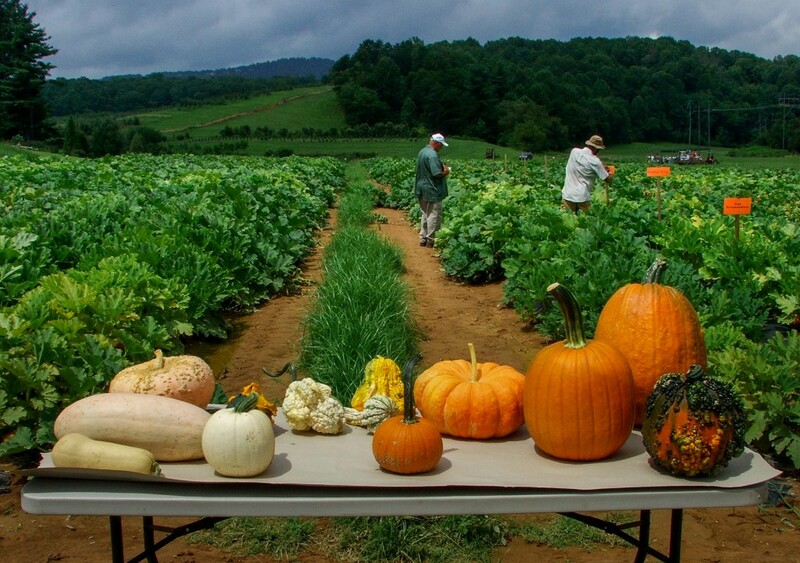 With the exception of the squash bug, squash vine borer, and spider mites, the complex of arthropod pests that attack cucurbit crops is similar on all crops. The three former pests are more specific regarding the crops they attack. Below is a list of common (C) and sporadic (S) pests that attack various cucurbit crops. (1) While cucumber and watermelon are sometimes reported as hosts of squash bug and squash vine borer, these insects are rarely found on these crops. Squash is a primary host of both. 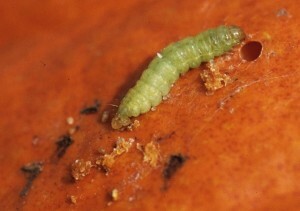 (2) Squash vine borer is a common pest in gardens or small plantings of squash and pumpkin, but it is encountered less frequently in commercial plantings. 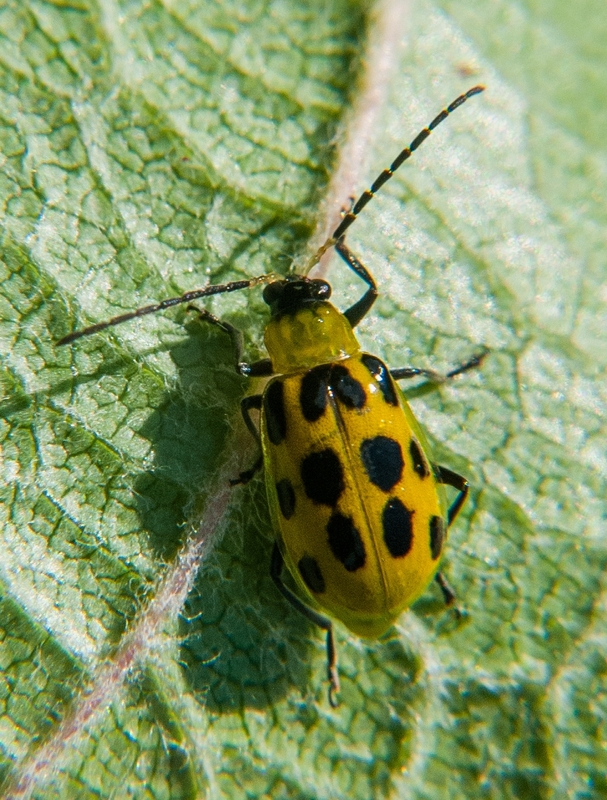 CUCUMBER BEETLES: The spotted and striped cucumber beetle are both serious pests of cucumber. They are the most common insect pests and can potentially cause damage from the time of emergence through harvest. They also vector bacterial wilt, which can cause premature death of plants. 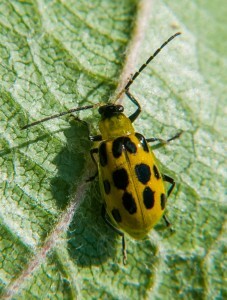 Adult cucumber beetles will also feed on ripe fruit, causing a scarring that renders the fruit unmarketable. APHIDS: Aphids (including melon aphid and green peach aphid) can build to large densities, and damage is usually the result of aphid honeydew accumulating on fruit. Aphids can also vector several different viruses, although most modern cucurbit varieties are resistant to common viruses. Insecticidal control of aphids will not control the spread of virus; instead the use of stylet oil sprays and reflective mulches can delay virus spread. 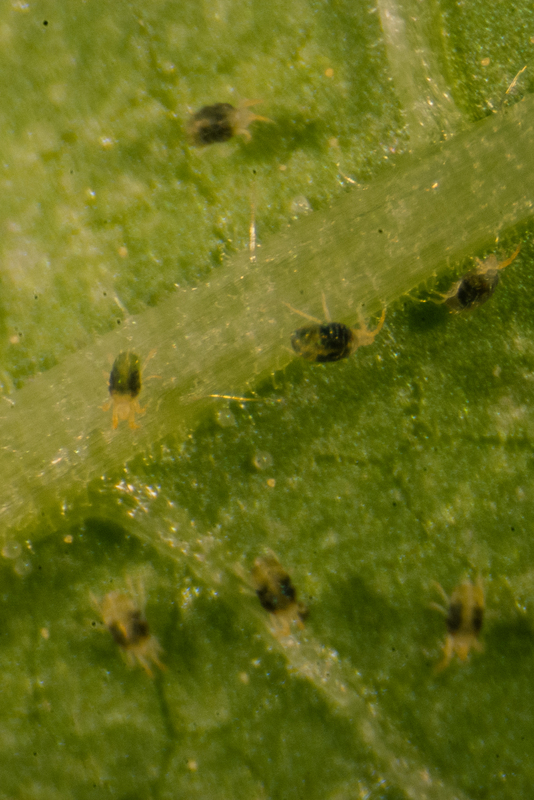 SPIDER MITES: Twospotted spider mites can build to high densities on cucumbers, most commonly in July or August. High mite populations are often associated with the use of pyrethroids. PICKLEWORMS: The pickleworm is a common late-season pest of cucurbits in NC. 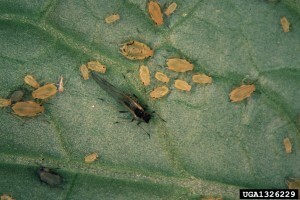 Control is rarely required before August, but damage is common if this insect is ignored during August and September. Insect control can be achieved with insecticides applied via foliar application, or, on crops grown with drip irrigation, via chemigation. The use of drip chemigation (application of pesticides through the drip irrigation system) can control most cucumber pests, including cucumber beetles, aphids, and pickleworm (and other lepidopteran pests). Application of these chemicals in the drip line results in long residual control – often for months. One shortcoming of chemigation is that it will not prevent adult cucumber beetles from feeding on and scarring mature fruit. Hence, chemigation should be supplemented with foliar sprays of insecticides if fruit scarring occurs. If not using chemigation, foliar insecticide applications should be made at 10- to 14-day intervals beginning at the first true leaf stage, and at weekly intervals after early August for pickleworm control. A diversity of neonicotinoid and pyrethroid insecticides provides excellent control of cucumber beetles. Pickleworm control is achieved with pyrethroids, Coragen, Belt, Avaunt, and Radiant. Excessive use of pyrethroids can lead to flare-ups of spider mites and aphids. (2) There are numerous pyrethroids registered on cucurbits; certain products may differ slightly in efficacy. Commercial products include, but are not limited to: Asana, Baythroid, Brigade, Danitol, Karate, Mustang Max, and Perm-Up. Check label for preharvest intervals, because they vary among products. (3) These insecticides can also be applied to the soil, including via drip irrigation. Soil applications provide much longer residual control. Soil applications of neonicotinoids have longer preharvest intervals than foliar applications. Check labels. (4) Bee toxicity rating is based on Cornell EIQ rating for bees, which is based on bee toxicity and plant surface half0life of pesticide: H = Highly toxic, M = Moderately toxic, L = Low to no toxicity. Among the pyrethroids, fenpropathrin (Danitol) and permethrin (Perm-Up) are moderately toxic, all others are highly toxic. First fruiting Coragen (chlorantraniliprole) 3.5 to 4 fl oz Pickleworm. 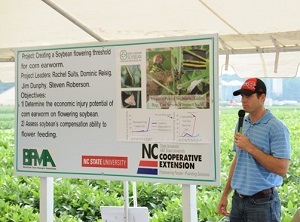 On early season crops where harvest is completed by early August, pickleworm control is often not needed. Mature fruit present Pyrethroids(2) (numerous brands) – see label Foliar applications may be necessary to prevent adult cucumber beetles from causing fruit scarring. Potential for damage is highest on cucumbers.